Let’s summarize briefly what we discussed in the previous chapter: We can never have a direct knowledge of the originals of what we see, hear, touch and refer to as "matter." Actually we interact with the perceptions that we experience in our brains. We can never step outside our brains to get in touch with the originals of what we see, hear, touch and so, and never can check how their originals are. There is no technical difference between dreaming and real life; we perceive both inside our brains. The wide world that we imagine to be so very enormous is actually a totality of perceptions transmitted into our brains. Gigantic galaxies, which we imagine to be billions of miles away, are actually simply perceptions in our brains’ visual center. They are not "out in space" at all, but right inside us. Many, if not almost all, people are unaware of this momentous truth. Yet even if others are unaware of it, that’s no excuse for us to be—because we also see the "others" in question as images in our brains. We experience these images, and are responsible for understanding what we see. Even if everyone we hear around us tells us, "This world is real, not a perception," that still changes nothing. In a dream, you may hear thousands of people shouting with one voice, "This world is real, not a perception". Yet that dream will soon come to an end. All those people will suddenly disappear. Beyond being perceptions, none of them ever existed in the first place. Kicking of a stone does not prove that one is dealing with the original stone that exists outside. The stone one has experience of is merely a perception in the brain. We can experience the same perception when dreaming. Those who object to the facts set out here are materialists, ones who falsely believe that matter is the absolute reality and that the human mind is only another form of matter. Generally speaking, materialists are unwilling to think about and discuss the obvious truth explained here, that we can never make direct contact with matter. Often they become quite frustrated with the idea. Back in the eighteenth century, materialists were incensed when the British philosopher and clergyman George Berkeley systematically explained that what we know about matter is actually a set of perceptions in our minds. The materialist thinker Samuel Johnson, who lived at the same time, kicked a stone and shouted out that by doing so, he had "refuted" Berkeley. However, Johnson’s primitive reaction and the similar assertions made by other, later materialists—merely show how far they are from grasping the truth of the matter. Neither kicking stones nor punching walls constitutes any proof of that they interact directly with the originals of stones and walls. Everything we do and feel at that moment is a set of perceptions inside our brains. Someone who kicks the stone or punches a wall is in fact kicking or punching the perception of the stone or the wall inside his brain. Indeed, they can kick a stone just as realistically in a dream, but everyone will certainly agree that the stone is no more than a perception in the brain. Materialists’ resistance on this issue is generally based on their failure to understand it. They’ve forced themselves into a dogmatic belief in matter’s absolute existence and strongly avoid ever questioning it. 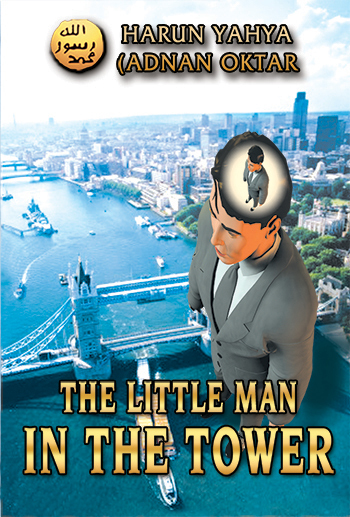 Here, we are pondering and revealing a truth they are unwilling to consider: that if they accept they have direct contact with the original matter, then they also must regard themselves as "the little man at the top of the tower." The image of the tower, which constitutes the title of this book, is just a metaphor we’ve used to help clarify the subject. Its meaning is this: If you maintain that you directly interact with the originals of the world and of your body, which exist outside your brain, then you must accept the existence of a giant body that carries all these images inside his skull. In that case, inasmuch as you perceive everything in your brain, you are a tiny person locked into a tiny room, atop a giant tower. One has experience of merely the perception and image of everything one believes he possesses formed in the brain. And one can never know their original forms in the outside. 1) Look around you at this moment, and you’ll see a large number of objects: furniture, walls, houses, people, cars, sky—and in addition to all these, your own body. All of these objects, including your own body, reside in the same place. 2) Where is that? Recall the explanations in the preceding pages, and you’ll realize that this "place" is nowhere but in the visual center within your brain. In other words, the entire world you deal with, including your own body, is in an area of just a few cubic centimeters behind your brain, in your skull. At this very moment, you’re looking at this book in that area in your brain. The hands that you see, and feel, as you turn these pages are also inside the visual and touch centers in your brain. All the organs in your body are located in the same place. The chair you sit in as you read and the room which houses that chair, are all there too. 3) Therefore, do you believe that you see your original material body other than this perception inside your skull? If you do believe that you see such a body, then you should realize that you have never been able to perceive it. Neither do you possess any information about what it might be like. All you can do is assume what it looks like. 4) If you believe that you see the original of your body, you must then accept the existence of a giant outside the body you see at this moment. Since you and everything you see—your room and all the objects outside—are in the visual center in that giant’s skull. Therefore, its physical body must also be enormous. Below the area where you are at the moment, there must lie shoulders, arms, a trunk, legs and feet (if the giant is, in fact, a two-armed, two-legged person like yourself). 5) That being the case, you must be a miniature human being living in a giant’s skull. To put this another way, imagine that you are imprisoned in a locked chamber at the top of a giant tower, never able to leave that room and merely watching a screen placed in front of you. In this analogy, the tower is your body, of which you maintain that you see the original, while the body that you perceive is only the little man imprisoned at the top of that tower. If you claim that you have a body whose exterior you perceive from the outside, then you must accept that you live imprisoned at the top of a giant tower; that you can never leave that room, but only watch the screen in front of you. You can never see this giant tower (i.e. the body of which you imagine that you directly see the original), because you are locked into a tiny room at its very top. You can never leave that room all through your life. You can watch only the images reflected on the walls of that room. Some objects in those images (stars, for instance) may seem to be millions of miles away. Yet the fact is, you still remain in that tiny room. In order to better understand this subject, take the example of the animated fantasy cartoons often shown on television. In some of these cartoon films, a giant robot is controlled by someone sitting at the command center in the machine’s head. For example, in the well-known film Voltran, giant robots are directed by a man sitting at the command center in the head section. The robot acts in accordance with that person’s commands. The commander is a tiny man sitting inside a mechanical man the size of a skyscraper. If you believe that you interact with the original of the body you see and feel at this moment, then you have to accept this system. To put it another way, you must accept that you are a little man sitting in a room at the top of a tower, or atop a giant robot. Consider that the body that you see and experience at this moment is approximately 5 feet, nine inches—or 1.80 meters—tall. Then, in comparative terms, you have to accept that the original body outside your brain, which you believe you have direct contact with, is giant-sized. If the body is a tower and the "I" perceiving it is a person in a cell at the top of that tower, then that tower must be hundreds of feet tall. If you have a 5' 9" image of the body you refer to as "me," then the body outside, which you accept that you have direct contact with, must be hundreds of feet high. The image of the car forms in a person’s brain. The visual center is no more than a few cubic centimeters in size. If the image of a car several feet in length fits into that area, then that visual center must be the size of a car, at least. If you claim that you are seeing the original of a wide valley, then the visual center in your brain must be an area many square miles in size. And if that center is a few meters in size, then the human brain must be of proportionally huge dimensions. If the human brain occupies such an immense space, then in proportion to his brain, a person’s body must be several miles in size. Here we are referring only to someone who glimpses a car. Consider a person seeing a valley several miles long. If he claims that he sees the original valley, then his visual center must, in the same way, occupy an area of at least several square miles. If so, then the person’ brain, internal organs, arms and legs must all be proportionate—and of colossal dimensions. Since such possibilities are out of the question, isn’t it quite illogical to claim that a car several meters long, or a valley of several square kilometers, actually exist outside and that the percipient is actually dealing with them in their original forms?